Ran into architect Larry Booth the other night at the opera, Dialogues of the Carmelites*. The bell was ringing for the start of the act two so Larry Booth and I didn’t have much time to talk. I told him that his firm’s 30 West Oak (still under construction) was looking really good. He said, “talk a lot about it, tell everybody.” So I will. Mostly with pix for now. and its solidity contrasts beautifully with the transparency of the new kid on the block. The Newberry has just a little glass. 30 West Oak is glass. The Newberry’s masonry holds the glass securely. At ’30,’ the glass has burst out and the window is the building. And the Newberry’s squareness nicely sets off 30 West Oak’s graceful curve. Ah, that curve! Almost like a Baroque push and pull it seems to take the receding curve of the sky, and bend it back towards us. This gives us a dose of extra space and because our vision no longer goes only in one direction but is reflected back in many directions, it’s as if we are given extra time. It’s only too bad this new gem on Oak street is such pricey condos. 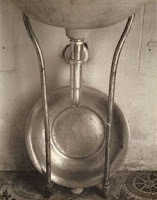 For the rest of us, well, we get this fine sculptural object. And – as I drove away, (in my car, nicely polished for springtime!) I noticed that 30 West Oak’s glass and curve cast lovely light on the ground nearby. With spring here, and daylight savings time (yes!) we’ll have plenty of chances to see this. *But you have ony two chances left to see the Dialogues of the Carmelites which also offers ravishing lighting! 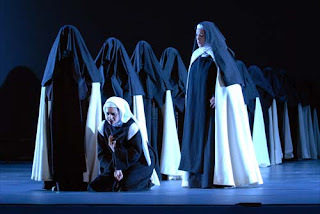 Lyric Opera of Chicago has atoned for its nearly half-century of ignoring Francis Poulenc’s masterpiece, “Dialogues des Carmelites,” by mounting an extraordinarily powerful and gripping production. It’s very spare and modernist, which maybe I prefer in buildings rather than opera, which I tend to like lush and lust-y. But get thee to this nunnery. The end alone is worth it. I wonder if Larry Booth liked it? You are currently browsing the archives for the Lyric Opera category.